Let’s talk about small kitchens. I’m not really talking about the kind of closet-small that you find in NYC. 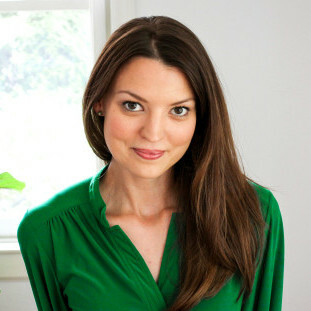 (When I lived in NYC, I could stand in the middle of the kitchen and reach the refrigerator, the sink, and the stove by simply pivoting around). Rather, I’m talking about the kind of kitchen-small that the majority of us have. That’s right. If your island can’t seat 9 people and your refrigerator only has one freezer, then yeah, you have a small kitchen. Ok, I’m joking. Sort of. Because, seriously. Kitchens are HUGE these days. I mean, people have MULTIPLE sinks. People have pot fillers. Really pretty, articulating, brass pot fillers that get pinned like crazy. And because we’re inundated with stunning kitchens everywhere we look, it’s easy to feel cramped in our average-sized 100-150 square foot kitchen. 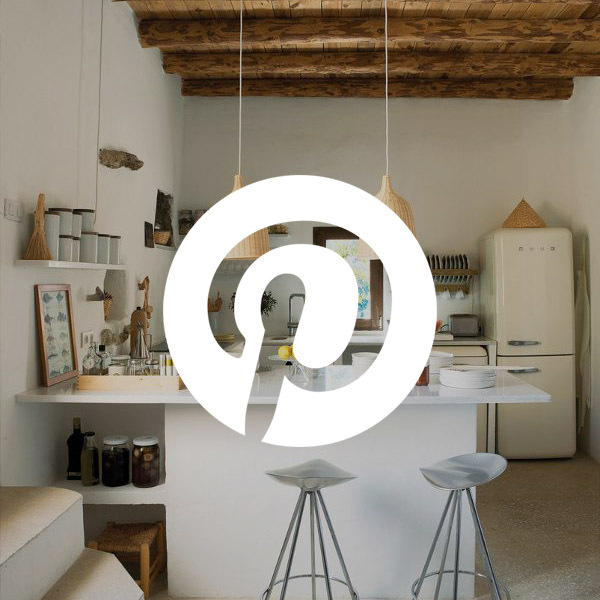 Today’s post is for those of you who want a dreamy new kitchen, but a) your kitchen is too small to fit an island and b) you’re on a budget. Do you find yourself crying while chopping onions? Only, it’s not the onions that are getting you teary-eyed. It’s the teeny cutting board that you have to chop said onions on. It’s the 12″ wide drawer that constantly gets jammed with utensils and that box of foil. It’s the 9″ sliver of counter space next to the stove that constantly gets piled up with random junk because it isn’t good for much else. It’s the inefficient corners and everything that gets gobbled up by corner cabinets. Well, even if you have a small kitchen, there are things you can do to avoid those areas of frustration. Here is a floor plan of a cute, small kitchen that I’ve designed. 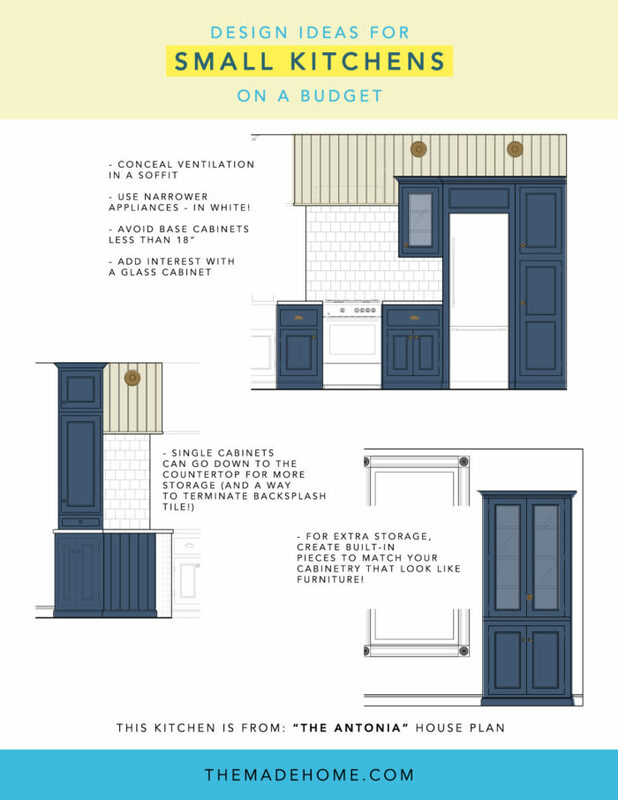 I’ve highlighted certain elements of the design that you can borrow for your project to help maximize space. This kitchen is from “The Antonia” house plan – one of the new plans I am now offering online for those of you thinking of a new build. Since this house is only 864 s.f., I had to get creative with the kitchen to make it functional. Avoid standard L-shapes. You lose a lot of function when you have a corner. Instead, use a galley-style layout or a linear layout with additional storage or cabinetry on another wall. You can still have an “L” or “U”-shape arrangement but avoid returns around corners – keep cabinetry linear along a wall. Use narrower appliances. Standard refrigerators are 33-36″ wide. Instead, look for a column refrigerator that is only 24″ wide. Oftentimes these are taller than the standard 67-70″ heights so that you don’t lose cubic storage space. Standard ranges are 30″ wide. Instead, look for a 24″ wide range. 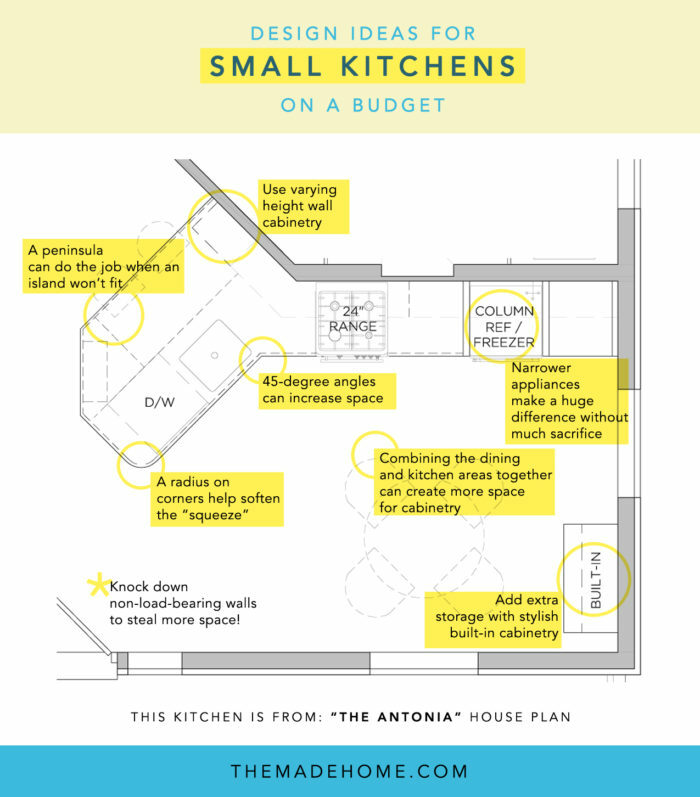 You will love the extra 6″ of prep space that you will gain if your kitchen is small. Dishwashers are typically 24″ wide, but you can also get them in 18.” These narrower appliances are carefully designed to work in compact spaces, so consider them if your tight on space. Using a narrower range, refrigerator, and dishwasher can help you gain as much as two whole additional feet of space. Consider angles other than 90 degrees. Though a 90 degree angle is cleaner, it boxes you into a grid that can really limit what you can do. Consider a 45 degree angle instead. In the floor plan example above, using a 45 degree angle meant being able to fit a peninsula with counter stool seating AND a round dining table for a traditional eating area. Had the return been 90 degrees, the space would have been too tight to fit a freestanding dining table. Plan a peninsula when an island won’t fit. Everyone wants an island these days, but a peninsula is a great alternative. You still get that open feel and extra counter space without needing the required floor space for an actual island. You can plan for counter stools and decorative pendant lights just like you would for an island too. Below are a few elevations of The Antonia kitchen with a couple of additional tips when it comes to cabinet design. Vary the heights on your wall cabinets. Avoid using only standard 30″ high wall cabinets that are 18″ above the countertop. Instead, look at how you can add additional storage with them. For example, in this kitchen, there is a single 18″ wide cabinet at the peninsula area. I decided to bring that unit up to the ceiling as well as down to the counter. Not only does it increase cabinetry storage, it also creates a great termination point for ending the wall tile and the soffit. It also takes the kitchen away from being generic; instead it has the style of a luxurious and large kitchen! Consider base cabinets that are 15″ or 18″ deep for secondary walls. 24″ is the standard depth for a base cabinet and is ideal for your primary work areas, but you can squeeze additional storage on other walls with a shallower depth. For a stylish approach, you can have your cabinetry made to look like a furniture piece. You can also save money having this added to your cabinet order instead of looking for a separate free-standing piece of furniture. For example, a 36″ wide hutch that is 7′ high can easily be a couple thousand dollars, while ordering cabinets to match the rest of your kitchen may only be $1000 or so. Add glass to a wall cabinet or two. Just because you don’t have a lot of space, doesn’t mean you can’t add style. Choose a wall cabinet to add glass to. Just like mirrors, glass also helps to make the kitchen feel bigger! Avoid cabinets that are less than 18″ wide. Try to layout your kitchen so that you don’t have tiny cabinets that can barely fit a small stack of tupperware. Remember, a 15″ cabinet doesn’t mean that your drawer will be 15″ wide. You lose quite a bit when you factor in the cabinet face frame. I try to plan for cabinets that are at least 18″ wide, 15″ minimum. If you do have an area that can only fit, say, a 9″ cabinet, look for a specialty cabinet, like one that has spice drawers, so that it can really be put to work. Consider a counter-height freestanding table in lieu of an island. In this plan, the kitchen and dining areas share the same space. If I were to build this house for myself, I might consider a 36″ high dining table instead of a standard 30″ high table. That way I can easily use the dining table like an island for additional prep and it could feature the same seating pieces as the peninsula for a clean look. Add a radius-edge to your countertop. If space is tight and you have an exposed corner like on a peninsula or island, consider having the countertop rounded so that it softens the edge. 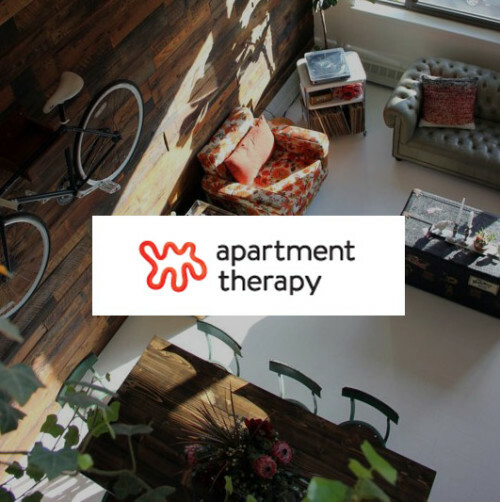 It not only eliminates the probability of you regularly bruising yourself on an edge in a small space, but it also visually enlarges the space. Isn’t that kitchen adorable? I really enjoyed designing that one. It looks like a high-end kitchen, but without the price tag. When I designed this kitchen, I envisioned this type of look. I love that the stove is under $600. It’s got a great retro vibe and is so affordable. 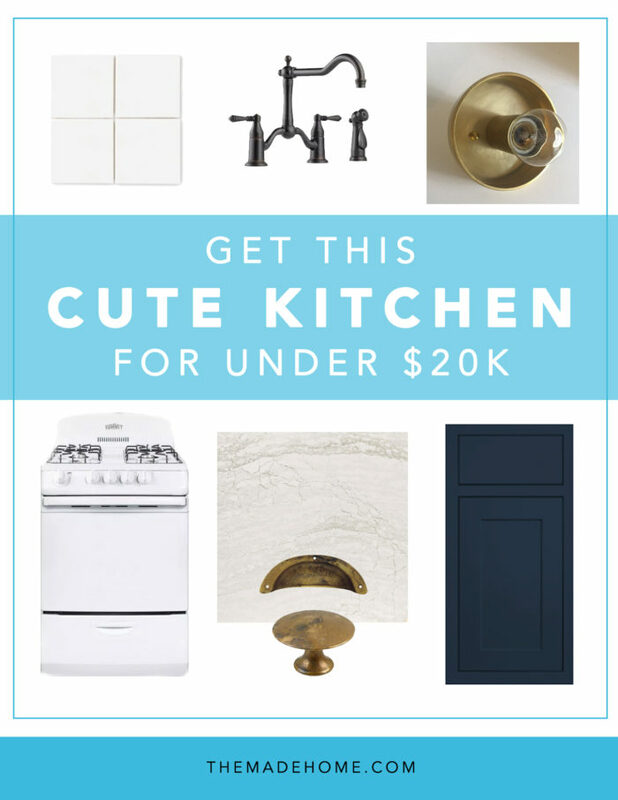 I spent some time sourcing some products for The Antonia kitchen (many selections are pictured in the image above) just to see how much that cute kitchen would cost. So I calculated square footages, put together cabinetry and countertop quotes online, and used a budget breakdown worksheet to help figure out the cost. My goal was to get it under $20K and whaddaya know, the final cost came in at $19,500. I think that’s pretty good for a brand-new kitchen complete with decorative glass cabinets, glazed ceramic wall tile, and quartz countertops. If you want to know what exactly I based the estimates on for this kitchen, you can click below. 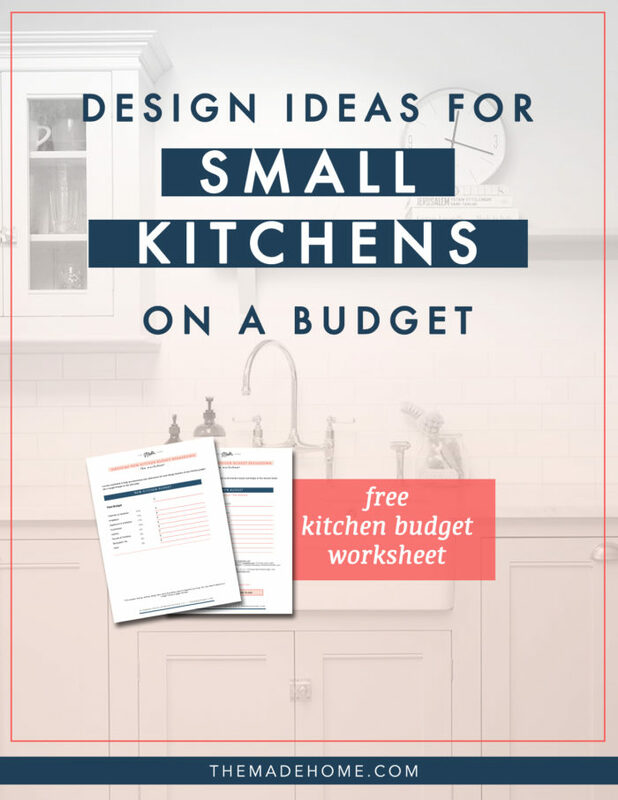 The free downloadable budget worksheet I am offering also includes a sample budget of this here kitchen and I’ve listed all of the sources as well as item numbers I used for this kitchen design. So even if you don’t purchase The Antonia house plan you can still get the look. It’s all free, yo! So, instead of putting in laminate countertops so that you can splurge on a light fixture, I’d do it the other way around – save money on the lighting so that you can have durable stone or quartz countertops. That’s just my preference though. I find it a lot easier to shop around for lighting and hardware to search for better deals than cabinetry and countertops. Very good ideas for me as i have both small kitchen and little money this ideas very helpful to me.